In the magnificent panorama of the Italian carriage makers of the 1950’s and 60’s and later, to most the famous known are Pininfarina and Bertone, Viotti was an equally brilliant coachbuilder founded in the early 20's. Founded in the early 1920's by Vittorino Viotti (who remained the owner and designer until he passed away in 1956), built bodies for various different car manufacturers from Fiat, Lancia and Alfa Romeo. 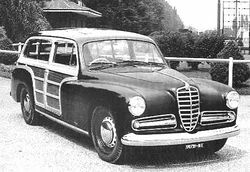 A good relationship with Fiat led to them being given more work and like the Alfa Romeo 2500 Giardinetta by Viotti (1952), one of the first Carrozzerie to mass-produce special versions. In the 1930's they designed two cabriolets based on the Fiat 508 Balilla, a two-seater and a four-seater. Fiat gave them a contract to produce these and went on to build thousands, which were sold by Fiat. The four seater was built in small numbers (but not sold by Fiat) as were a variety of other models. 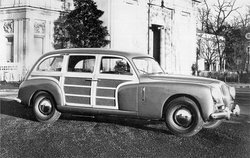 After the war they were pioneering in the development and production of a Woody Estate Car (Giardinetta) their first models being based on the Fiat 1100. 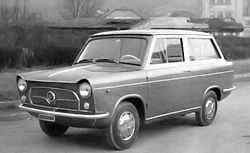 These were highly successful, a fact which can be seen in that they were copied by many other companies, including Fiat themselves. They continued to build a variety of vehicles (coupés, cabriolets, etc) until they closed in 1964. Among the many designers who worked there, special mention should be made of Revelli and Frua.